This Apple Watch portable charger provides on-the-go power and is the only travel solution that lets you use your watch in Nightstand mode, too. The pocket-sized design combines an induction charging pad with a built-in Lightning cable and a USB port to charge three devices all at the same time. Note: Power cord is located in the white cardboard compartment underneath the "insert"
Dimensions: 6" x 4.4" x 1.2"
This was a gift for my daughter and she loves it. We took it on a recent trip and it worked great. My husband loves it! 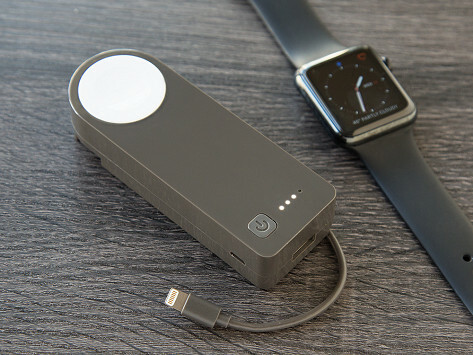 When charged up, Time Traveler can provide around seven Apple Watch charges, or give other devices an emergency boost. And it’s the only Apple Watch charging solution that supports Nightstand Mode—which is when the watch functions (on your nightstand) as an alarm clock.